California Presses the Boundaries of the Federal Arbitration Act (FAA). California’s New Attempt to Press the Boundaries of the Federal Arbitration Act (FAA). California has a long history of pressing the boundaries of the Federal Arbitration Act (FAA). In doing so, California has resisted the federal government’s Supreme authority to establish the laws of the land. “The Federal Arbitration Act states that a ‘written provision’ in a contract providing for “settle[ment] by arbitration” of ‘a controversy . . . arising out of ‘ that ‘contract . . . shall be valid, irrevocable, and enforceable, save upon such grounds as exist at law or in equity for the revocation of any contract.’” 9 U. S. C. §2. DIRECTV, Inc. v. Imburgia (2015) 577 U.S. __. Such contracts are generally interpreted according to their plain reading. California has resisted the FAA’s plain reading interpretation of contracts by insisting that California law and/or policy should influence the interpretation of arbitration agreements. California’s initial struggles culminated in the ruling of AT&T Mobility LLC v. Concepcion. 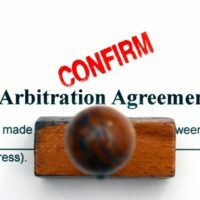 In this case, the Supreme Court overruled a California decision that allowed the arbitration of class proceedings despite the existence of an arbitration agreement that clearly did not permit class proceedings. On December 14, 2015, The Supreme Court again overruled a California decision by stating that California’s class action waiver laws are pre-empted by the FAA. See DIRECTV, Inc. v. Imburgia (2015) 577 U.S. __. It is notable that, in DIRECTV, the Supreme Court ruled that “the parties are free to choose the law governing an arbitration provision, including California law as it would have been if not pre-empted.” In fact, “the Federal Arbitration Act allows parties to an arbitration contract considerable latitude to choose what law governs some or all of its provisions, including the law governing enforceability of a class-arbitration waiver. [citation] In principle, they might choose to have portions of their contract governed by the law of Tibet, the law of prerevolutionary Russia…” Id. In light of the DIRECTV ruling, which allows for the parties to “choose” the “law governing an arbitration provision”, why does California again believe it can push the boundaries of the FAA and the Supremacy Clause by approving a law that prohibits the parties from choosing the “law governing the arbitration provision”? In other words, why does California believe it is permissible to pass a law that restricts employers and employees from mutually agreeing to “law governing the arbitration provision”. California’s new law is ripe for lawsuits challenging its permissibility pursuant to the pre-emptive laws of the US. We will post again as soon as we hear about the first challenge to California’s new overstep.